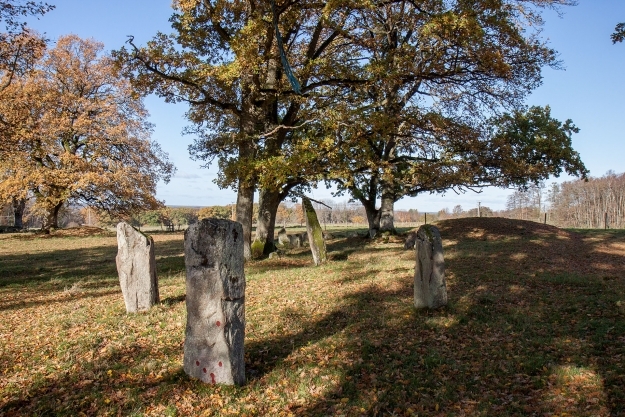 By road: Västra Tunhem is located at the western edge of Hunneberg a few km north west of the city Trollhättan. There is no car park at the entrance to the burial. However it is possible to park along the wall to the parsonage located approximately 200 m east of the burial ground. The burial site with their mounds, stone settings, stone circles and standing stones is one among several burial grounds in Västra Tunhem. Right next to the west is a grave site with with 6 mounds and three stone settings. Another few hundred meters to the west across the road is another site with 17 mounds and 71 stone settings. In the surrounding landscape are plenty of rock carvings in the form of cup marks. Together, this indicates rich settlements from the Bronze Age onwards but perhaps particularly during the Late Iron Age. 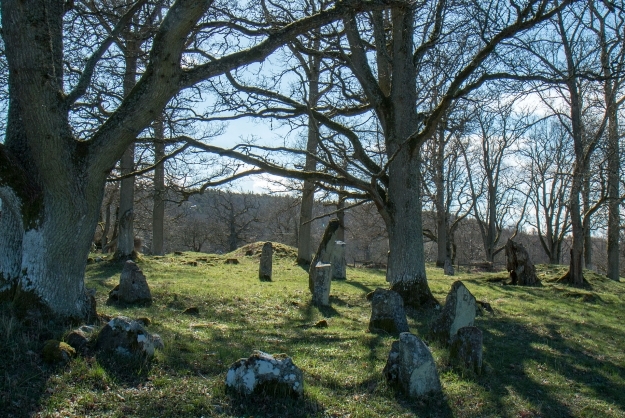 The burial site is located i Väne district, Viniæhræræd in the late 1200s. According to a Swedish place names dictionary the district name contains genitive singular or plural of wine ‘pasture; meadow’. The name Tunhem is taken from the vicarage. You can read more about the burial site on Bengans historiasidor. (in swedish). The ancient remains on the burial site.